Today is the official start of the High Point international furniture market. Scott has been attending this show as an industry professional for more than 40 years. Furniture Today is the daily news magazine to the trade. 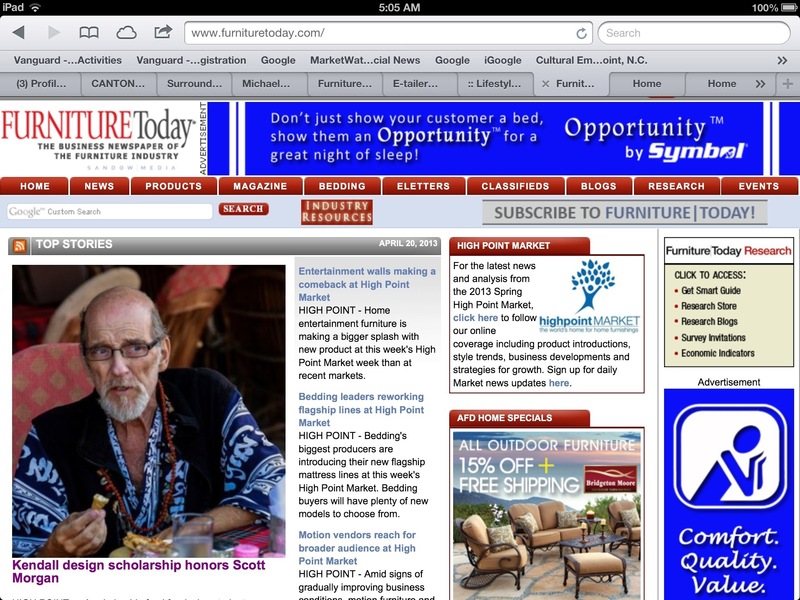 Guess who is on the cover of Furniture Today in his Japanese yukata robe and Tibetan shaman’s beads? That’s our very own intrepid hero and furniture guru, Scott Morgan. The majority of his friends and colleagues attend market. It has been a very tough week for Scott physically and emotionally, knowing that his father, his sister, and most of his buddies are at High Point and he is not. Nearly 200 friends showed up for Scott’s farewell party six months ago during the last market after the shockwaves of Scott’s inoperable cancer rippled through opening day of High Point. It didn’t take but a moment for Scott to decide and explain to everyone why we were going to goa. Before we even got on the plane two weeks later, Scott’s friends and industry colleagues Bruce Hirshaut, Bill DeGolia, and Louis Lara had formed a scholarship fund in Scott’s name and enlisted several others to make it a reality. An announcement about the scholarship is the reason for Scott’s image being featured on Furniture Today on opening day of High Point. I’m imagining thousands of vendors and designers and market workers are carrying the magazine around this Saturday. It’s pretty cool that somehow Scott still is walking all over the market today, isn’t it? Unfortunately there are many inaccuracies in the article but we are confident that the Scott Morgan Design Scholarship commitee will sort that out. Meanwhile we believe the old adage is true that any publicity is good publicity and that Scott’s scholarship will benefit. This entry was posted in Uncategorized and tagged art, design, furniture today, Going to Goa Blog, high point international furniture market, Scott Morgan, scott morgan design scholarship, traveling with cancer. Bookmark the permalink. … guessing you came in already knowing something … and certainly most wld say … valiantly attempted to let us all in on the secret. Obviously it worked … even if half assed backwards … or even if only catching a glimpse … some slower than others … but no one can go back! Thank all the Gods and Gurus! Well done! from where it all started … and will continue! Again Bravo … Well done! You are “bi-continental” ! Clearly Scott is there in a big way on the cover of the magazine. Bravo Scott! Congrats on this recognition Scott. Much deserved acclaim!! Like Katy, I think it’s wonderful that you are front and center at the market this season. It’s where you are supposed to be at this time of the year!